Does Knowledge Become More Accurate Over Time? Change lies deeper in the knowledge substrate than time. Knowledge is not necessarily coupled with time, but it can be influenced by it. It can be influenced by change of any kind: not only time. Knowledge may exist in a moment and vanish. The incipient perspective(s) it contains may change. Or the perspective(s) that it comprises may resist change. Also, knowledge changes with reality and vice versa. Time requires events to influence this relationship between knowledge and reality. Knowledge cannot be relied upon to be a more accurate expression of reality, whether time is involved or not, because the relationship between knowledge and reality is not necessarily dependent upon time, nor is there necessarily a coupling of the relationship between knowledge and reality. The relationships of ‘more’ and ‘accurate’ are also not necessarily coupled with time. Example: Eratosthenes calculated the circumference of the Earth long before Copernicus published. The ‘common knowledge’ of the time (Copernicus knew about Eratosthenes, but the culture did not) was that the Earth was flat. It’s at this juncture that concepts begin to coalesce. Within this ‘Holy of Holies’ concepts are born and form/generate their associated continuums. It’s like watching the blue wisping stars newly born in the constellation of Pleiades. This ‘event horizon’ is so crucial to understanding and participating in mind; yet those who should know better simply ignore or overlook it. He clearly exhibited these awarenesses on several occasions. He was able to envision many ideas to their completion before constructing them; and his instinct for somehow ‘knowing’ (flashes of insight) what to do next and where to go with an idea were so profound that it often overwhelmed and incapacitated him. His mind was so fertile that layers of creative impulses were being maintained concurrently. Next to Socrates there are very few who inspire me. 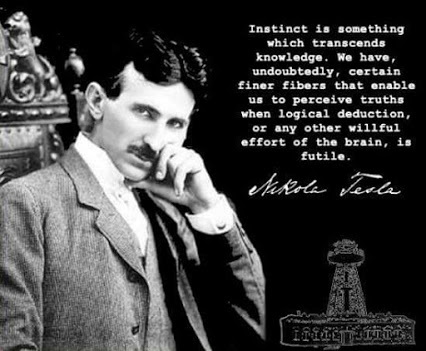 Tesla is one of those few. It’s a book everyone in knowledge representation should at least know about. It has great tips and clarifications inside. Unfortunately it is also based solely on ontologies so it provides only limited value for what I’m doing, but it is a valuable resource for understanding and creating visualizations just the same. Earth Day: This is another brilliant video that unfortunately assigns the condition of our world to humans as a whole. Certainly WE ALL are responsible by allowing it to happen in OUR name, but the corporations (artificial persons) and the banksters (which run the corporations) are who have performed the deed! We are losing our individual and collective sovereignty through ruses like ‘Climate Change’ (Global taxing scheme). We should now take the corporations down and replace them with real humans and not the 1871 version that allows them to enjoy those rights of being human and yet are exempt from the responsibilities that real humans must answer to. This man is well intentioned, but not up to par on what needs to be done. He is passionate, but unfortunately not enlightened. The onus is on us for allowing it to continue, but the onus is on the corporations and banksters, for directing humanity towards where we have come! Why is Fukushima no longer in the news? Why is the Gulf spill no longer in the news? Why do we no longer think about them? Here is where WE ALL are responsible! I’ve published this before elsewhere, but it must be restated now for what is to follow (I’m starting a new octave). What is this video about? In this introductory video I would like to explain what knowledge representation is, how to build and apply them. There are basically three phases involved in the process of building a knowledge representation. Acquisition of data (which includes staging), collation and the representation itself. The collation and the representation phases of the process are mentioned here, but I will explain them further in future videos. You are now watching a simulation of the acquisition phase as it collects and stores preliminary structure from the data it encounters in terms of the vocabulary contained within that data. Acquisition is a necessary prerequisite for the collation phase following it, because the information it creates from the data are used by the collation algorithms which then transform that information into knowledge. acquisition, these parsers may even even run concurrently as is shown in this simulation. The objects you see moving around in the video are of two different kinds: knowledge fields or knowledge molecules. Those nearest to you are the field representations of the actual data being collected called knowledge fields. They could represent an individual symbol, punctuation, morpheme, lexeme, word, emotion, perspective, or some other unit of information in the data. Each of them contain their own signature – even if their value, state or other intrinsic properties are unknown or indeterminate during the acquisition. These ‘molecules’ also contain their own set of signatures and may be composed of a mixture of fields, meta-fields and hyper-fields that are unique to all others.The collation phase has the job of assigning these molecules to their preliminary holarchical domains which are then made visible in the resulting knowledge representation. Uniqueness is preserved even if they contain common elements with others in the domain they occupy. Clusters of knowledge molecules and/or fields grouped together are known as ‘knowledge domains’, ‘structural domains’,’dynamical domains’ or ‘resonance domains’, depending upon which of their aspects is being emphasized. We now need a short introduction to what knowledge representation is in order to explain why you’re seeing these objects here. Knowledge representation provides all of the ways and means necessary to reliably and consistently conceptualize our world. It helps us navigate landscapes of meaning without losing our way; however, navigational bearing isn’t the only advantage. Knowledge representation aids our recognition of what changes when we change our world or something about ourselves. It does so, because even our own perspective is included in the representation. It can even reveal to us when elements are missing or hidden from our view! It’s important to remember that knowledge representation is not an end, rather a means or process that makes explicit to us everything we already do with what we come to be aware of. A knowledge representation must be capable of representing knowledge such that it, like a book or other artifact, brings awareness of that knowledge to us. When we do it right, it actually perpetuates our understanding by providing a means for us to recognize, interpret (understand) and utilize the how and what we know as it relates to itself and to us. In fact – knowledge representation even makes it possible to define knowledge precisely! Knowledge is not very well understood so I’ll briefly point out some of the reasons why we’ve been unable to precisely define what knowledge is thus far. Humanity has made numerous attempts at defining knowledge. Plato taught that justified truth and belief are required for something to be considered knowledge. Throughout the history of the theory of knowledge (epistemology), others have done their best to add to Plato’s work or create new or more comprehensive definitions in their attempts to ‘contain’ the meaning of meaning (knowledge). All of these efforts have failed for one reason or another. Using truth value and justification as a basis for knowledge or introducing broader definitions or finer classifications can only fail. I will now provide a small set of examples of why this is so. Truth value is only a value that knowledge may attend. Knowledge can be true or false, justified or unjustified, because knowledge is the meaning of meaning. What about false or fictitious knowledge? Their perfectly valid structure and dynamics are ignored by classifying them as something else than what they are. Differences in culture or language make even make no difference, because the objects being referred to have meaning that transcends language barriers. Another problem is that knowledge is often thought to be primarily semantics or even ontology based! Both of these cannot be true for many reasons. In the first case (semantics): There already exists knowledge structure and dynamics for objects we cannot or will not yet know. The same is true for objects to which meaning has not yet been assigned,such as ideas, connections and perspectives that we’re not yet aware of or have forgotten. Their meaning is never clear until we’ve become aware of or remember them. In the second case (ontology): collations that are fed ontological framing are necessarily bound to memory, initial conditions of some kind and/or association in terms of space, time, order, context, relation,… We build whole catalogs, dictionaries and theories about them! Triads, diads, quints, ontology charts, neural networks, semiotics and even the current research in linguistics are examples. Even if an ontology or set of them attempts to represent intrinsic meaning, it can only do so in a descriptive (extrinsic) way. An ontology, no matter how sophisticated, is incapable of generating the purpose of even its own inception, not to mention the purpose of objects to which it corresponds! The knowledge is not coming from the data itself, it’s always coming from the observer of the data – even if that observer is an algorithm! Therefore ontology-based semantic analysis can only produce the artifacts of knowledge, such as search results, association to other objects, ‘knowledge graphs’ like Cayley,.. Real knowledge precedes, transcends and includes our conceptions, cognitive processes, perception, communication, reasoning and is more than simply related to our capacity of acknowledgment. In fact knowledge cannot even be completely systematized, it can only be interacted with using ever increasing precision! • Knowledge is what awareness does. • Awareness of some kind and at some level is the only prerequisite for knowledge and is the substrate upon which knowledge is generated. • Awareness coalesces, interacts with and perpetuates itself in all of its form and function. • Awareness which resonates (shares dynamics) at, near, or in some kind of harmony (even disharmony) with another tends to associate (disassociate) with that other in some way. • These requisites of awareness hold true even for objects that are infinite or indeterminate. • This is why knowledge, the meaning of meaning, can be precisely defined and even provides its own means for doing so. • Knowledge is, pure and simply: the resonance, structure and dynamics of awareness as it creates and discovers for and of itself. • Awareness precedes meaning and provides the only fundamentally necessary and sufficient basis for meaning of meaning expressing itself as knowledge. • Knowledge is the dialog between participants in awareness – even if that dialog appears to be only one-way, incoherent or incomplete. • Even language, mathematics, philosophy, symbolism, analogy, metaphor and sign systems can all be resolved to this common denominator found at the foundation of each and every one of them. The objects on the surface of the pyramid correspond to basic structures denoting some of the basic paradigms that are being used to mine data into information and then collate that information into knowledge. You may notice that their basic structures do not change, only their content does. These paradigms are comprised of contra-positional fields that harmonize with each other so closely that they build complete harmonic structures. Their function is similar to what proteins and enzymes do in our cells.